Colour measurement is required in many industry sectors, enabling companies to select, monitor, differentiate, grade and sort various types of coloured objects involved in manufacturing, automated handling, warehousing, packaging, wrapping and other production processes. Measured objects can take the form of solids, powders or liquids and it is also possible to measure the colours of transparent or translucent surfaces such as coatings, labels and plastics, as well as LEDs and glass objects. Colour sensors also enable the position monitoring of objects such as pallets, tiles, textiles, granulates, pills, soldering points, food products, liquids and so on. Colour recognition sensors are also available for observation tasks, including the degree of ripeness of fruit, coated foods, varnish and coloured liquids. In terms of industry sectors, colour sensors have found applications in automotive (vehicle interiors and paintwork), machine building & automation, electricals, chemicals, pharmaceuticals, cosmetics, medical, food and beverage processing, agriculture, security, paper, printing and packaging. The human eye has three colour receptors, which is why 3 Dimensional colour models are used to clearly identify colours and to compare these with other colours. When defining a colour of an object, the term ‘colour space’ is often used. 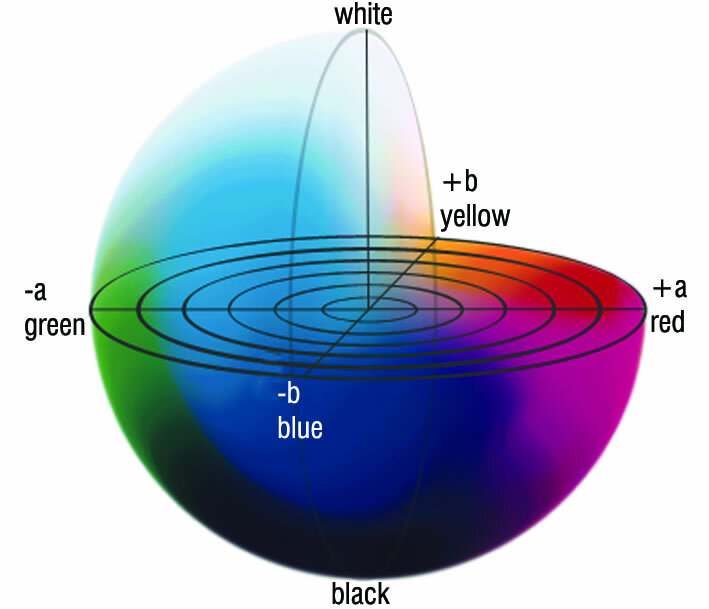 One of the most frequently used colour space models is the L*a*b* colour space. The L*a*b* colour space comprises all colours perceptible to the human eye. In this 3D colour model, the L-axis is a correlation of lightness, the a-axis relates to redness and greenness, while the b-axis describes the colours from blue to yellow. The L*a*b* colour space serves as a device or sensor-independent model. The colours are defined regardless of their method of production and their output technique. The larger the difference between the colours within the colour space, the more clearly the difference can be perceived with the human eye. A colour sensor compares colours, or more accurately, checks if colour values match. The measurement object is illuminated using a light source (normally LED) and the reflected colour components are then evaluated. The colours of the inspected object can be taught to the sensor and stored in a colour memory. These taught colours can be assigned acceptable deviation tolerances. 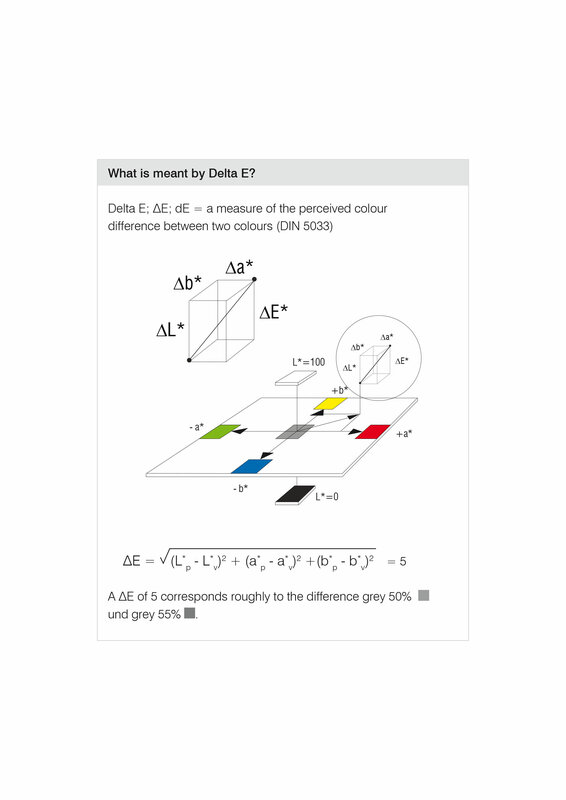 The stored colour values are compared with the determined values by calculating the colour difference, Delta E (ΔE) between object colour and the taught reference value. The colour difference ΔE is the result of the three coordinates in the L*a*b* colour space: position on the red-green axis (a), position on the yellow-blue axis (b) and brightness (L). If these values match (within the tolerances), a useable output signal is generated. One of the benefits is that the sensor evaluates the colours in the same way as the human eye, which is why the sensor is called a perceptive or true colour sensor. 5: very large colour difference. In practice, colour differences between 0 and 1 often play an important role. Typical industry specifications would be 0.1 for the automotive industry and 0.3 for paper manufacturing. To put this into perspective, between 0 and 0.5 ΔE, there is none to almost no recognisable difference to the human eye. A trained, practised eye can recognise the difference between ΔE values of 0.5 and 1. The accuracy of most inline colour sensors in the marketplace are typically defined with a ΔE of 1-1.5, which represents similar performance to the human eye. However, modern colour sensors offer a ΔE of 0.8 at relatively competitive price levels. This is enabling more applications to be solved in-process, measuring 100% of produced parts that previously would have to be measured offline by a high performance measurement system, resulting in only a low batch sample being measured. New developments have seen the introduction of high performance colour measurement systems that use a spectrophotometer for colour measurement/evaluation. The performance of these systems is typically a ΔE of 0.1, which is 10 times greater than most production tolerances. This enables users to solve applications that were previously not possible. Traditionally, high performance colour measurement systems were only able to measure at slow speeds, meaning the product usually has to be measured offline. 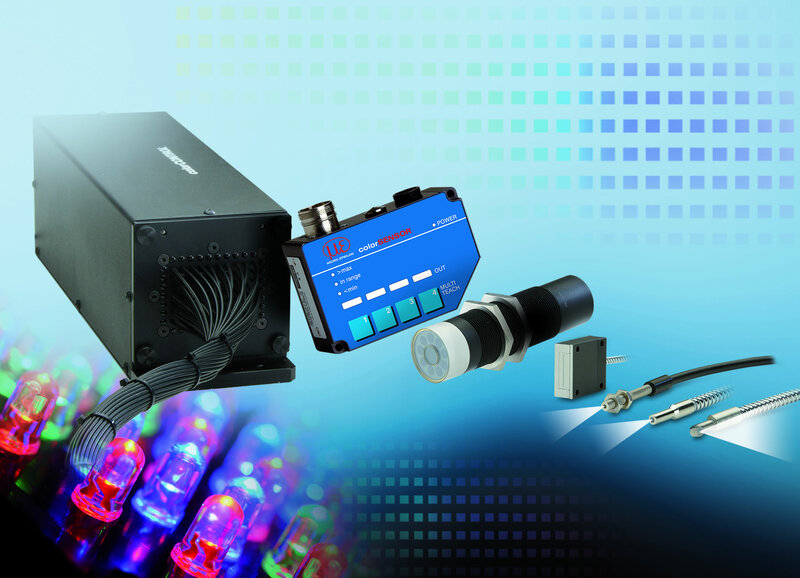 However, some high speed colour measurement systems now have selectable measurement speeds of up to 2 kHz, allowing them to be integrated into production processes, where they can continuously monitor 100% of products produced. This can lead to dramatic improvements in automated inspection, quality control, production efficiencies and product quality, while also reducing operational costs and waste. Stephen Smith is Product Sales Engineer at Micro-Epsilon UK.